You sigh knowing that despite your hard work, this year’s conference is going to be just like the last 10. Don’t assume your audience is not engaged. And don’t let your speaker’s insinuate the same. Rather, take the necessary measures to make sure everyone is interacting and engaged. After all, this event is extremely important for everyone’s business goals. And the audience’s learning plays a huge role in its success. So pull out all the stops. Here’s what you can do to drive engagement when using an event app at your next event. Live voting. Use the event app’s polling tool and ask the audience questions on-the-fly. As attention spans wane, push a question, get real-time results and project them onto the main screen so that everyone’s involved in the activity. Brainstorming. You can engage attendees to generate content with the event app’s brainstorming feature. Participants can either ask questions or come up with ideas, and then group works together to organize ideas into effective strategies. Putting attendees in charge of creating slides or presentations. Tools in the event app, like the ability to put digital “pins” on slides, give the audience the ability to take control of slides. Trivia. Create a trivia game to engage attendees and ask them questions about the company’s history, brand messages, strategies or other attendees. Challenges. Challenge the audience to “meet the most people” or “meet someone new”. An event app can track this data by allowing attendees to scan each other’s business cards to make formal connections, or organize a meeting at random. Photo stories. Let the audience create mock-up company scenarios with the photo story feature. Teams can role play an idea and use their creativity to come up with a comic strip (that includes the ability to insert pictures, speech bubbles, and digital accessories) to reveal their answer. The fishbowl format. Manage larger group discussions with the fishbowl approach. Identify a group of participants to act as panel members who will engage in a discussion about hot topics or controversial ideas. The “listeners” take careful notes as the discussion goes on, and then eventually the roles reverse, with the panel members becoming the listeners, and vice-versa. Speed meetings. Kind of life speed dating but for the business world, speed meetings encourage people to move about the room and meet new people. It can be as simple as a 30-second introduction before moving onto the next person. Or you can prompt people to give precise information, such as their name, where they’re from, their role and what they hope to get from the event. Changing seats. Nothing gets people interacting better than prompting them to leave their comfortable seat next to people they know and move to a table full of opportunity. Bean bags. Get the audience out of uncomfortable, formal chairs and move the group to a bean-bag setting. The meeting layout alone invites a relaxing conversation. Don’t let your hard planning go to waste by leaving audience engagement to chance. 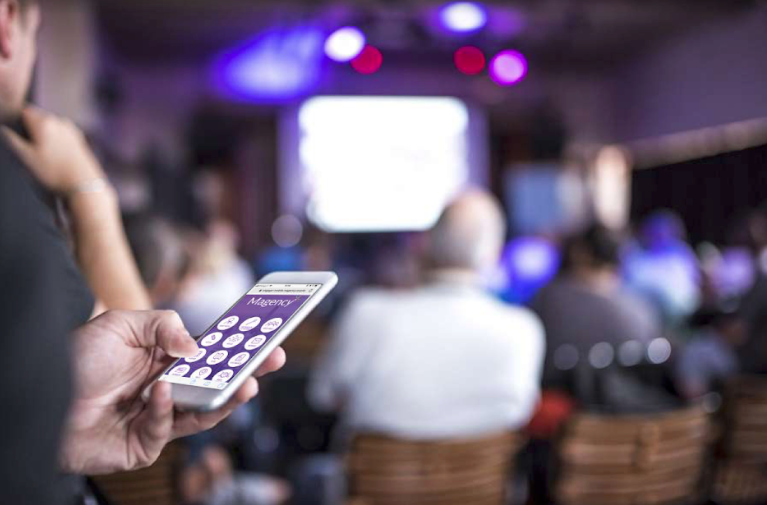 Get your audience highly involved and invested in your next conference with an event app that promotes interaction, collaboration, and team building. Put the audience in control of content and presentations through live voting and brainstorming. Add fun by using gamification features like trivia, challenges and photo stories. Finally, interactive meeting layouts like the fishbowl format, speed meetings, changing seats and bean bags turn a boring chairs-in-a-row meeting into a lively, fun, engaging environment where the audience is invested. How do you encourage audience interaction when using event-app technology?